Back-to-school and end of summer are here. No more countdowns, the final days are upon us. This weekend we are headed to Ontario for one final weekend road trip before our oldest begins high school, and our youngest tackles 4th grade! Whenever we travel the kids depend on us to keep them safe and fed. I can do the snacks, but for a huge part of the safety, I go to our Sam’s Club. A Sam’s Club membership continues to get you unbeatable back-to-school deals on everything, including auto & tire services! The Sam’s Club Dare to Compare all-in tire offer is truly unbeatable. Sam’s Club offers the best tire brands at the best all-in price, matching offer. 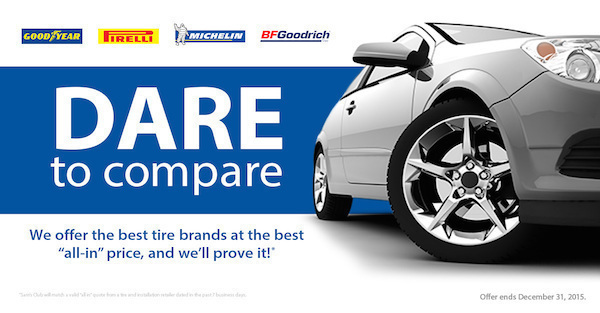 These tire brands include: Michelin, Goodyear, BF Goodrich and Pirelli. Not only does Sam’s Club offer a fabulous price on tires, but they also include the Tire Installation Package with each tire purchase. The Tire Installation Package makes this deal unbeatable! ($15/tire, $25/dually tire). Check it out! Best of all is the assurance you get of not only the best prices and service, but the confidence to transport your own scholars in worry-free fashion. Our girls know we take their safety seriously, and that we use Sam’s Club for tires. Do they look worried? Be certain to enter the gift card give away Parent Palace is hosting! Sign up now for your chance to win a $250 Sam’s Club gift card. Protect your family and your budget with the Sam’s Club Dare to Compare Tire Event! Back-to-school is a great chance to spend precious time with the one’s you love most, and it is the perfect time to make sure you are carrying them on the most dependable tires backed by the best professionals and guarantees in the business! Good luck to us all – and safe travels!